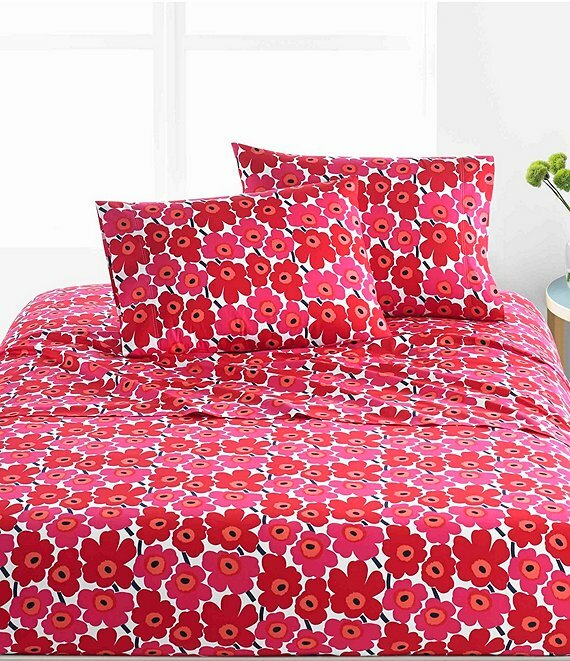 This pattern is a true classic and part of Marimekko's first floral collection designed in 1964. Due to its perennial popularity over the years, it has become synonymous with the brand. The design has been produced in many different colors, but by far the most iconic color way is the signature Poppy Red. One Twin XL flat sheet 96 X 66"
One twin XL fitted sheet 80 X 39"
One standard pillow case 20 X 30"
One full flat sheet 96 X 66"
One full fitted sheet 75 X 54"
Two standard pillow cases 20 X 30"
One Queen flat sheet 102 X 90"
One queen fitted sheet 80 X 60"
One King Flat Sheet 102 X 108"
One king fitted sheet 80 X 102"
Two king pillow cases 20 X 40"